Photo attributed to Flickr user Grand Velas Riviera Maya. In 1991 I traveled for the first time to a faraway tropical land, a land like the one in dream: Costa Rica. I lived in a small seaside hotel in Montezuma which belonged to a German woman and her family and I was very touched and inspired to see that there actually are people who live this dream. But of course I still didn’t think it could ever be me. So I went back to Hamburg with my husband, back to my life and career in the music industry, which was quite exciting and fulfilling, but deep inside of me I still had that longing, I wanted something more from life. On my 30th Birthday, I suddenly knew that it was “now or never.” It was just a feeling in my gut, but it was so strong I knew I had to follow it. So I left my life in Germany behind, quit my well paid job, left my husband and traveled with two suitcases into an unknown adventure to Los Angeles. 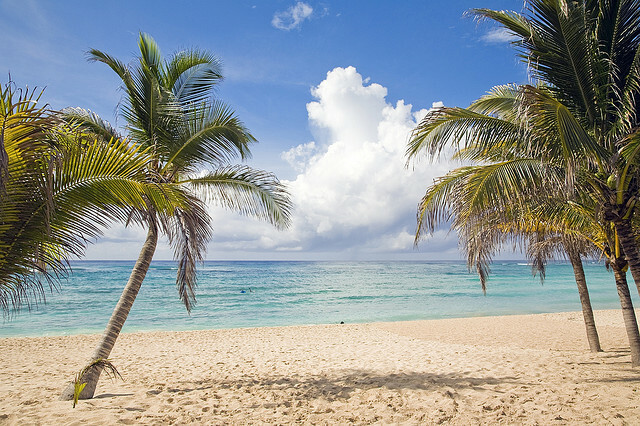 There were at least my palm trees, the beach and the sun. I started a small agency for photographers and organized photo productions. It did not take long before I first came into contact with yoga and found my wonderful yoga teacher Christi Minarovich. Initially skeptical, I listened to her stories and the yoga philosophies: to let things go, accept where you are, things will fall into place…a far cry from what I had learned in Germany, where I was more the type of person pushing forward rather than letting go and sitting and waiting to see what happens next. But there was something that immediately touched me deeply and gave me hope, strength and confidence and so I soon started learning to let go more and instead to rely on my intuition. I learned to breathe, to find the beauty in life. I started to soften and surrender and suddenly more and more doors started opening for me. Yoga gave me a new view of life, a new sense of purpose and the answers to many of my questions. After three and a half years in Los Angeles, I moved to New York where I continued working for photographers and deepening my yoga practice. Here I found Elena Brower and Anusara yoga and I loved it so much that I went to yoga 4-5 times a week. Then in 2000 I booked a trip to Costa Rica, and that is what changed everything. I went back to the place that had fascinated and touched me so much in 1991: Montezuma. Nine years later it was still there, a small fishing village, sleepy and quiet. It had not changed much. And as it happens in life, I soon fell in love with the owner of the Hotel Los Mangos. On the property there was an open pavilion that was previously used as a restaurant, but had just been closed two months prior to my arrival. Open air, with a wooden floor and overlooking the sea- the perfect quiet place for yoga! I thought about bringing yoga teachers from the U.S. and organized and booked the first retreat with my teacher Elena Brower for November 2001. After September 11th happened, I packed my suitcases in New York and decided to jump fully into my new adventure in Costa Rica. And then it hit me: here I was, 20 years later, in my dream of living a life by the sea! Everything seemed to fall into place easily for me, I just needed to say yes to open new doors. It was an incredible feeling of Bliss! Elena then came for her retreat and she encouraged me to become a yoga teacher myself; so I started training as a yoga teacher in New York. For more than 10 years now I have been living my dream and it is the yoga which always continues to encourage me to see the good, the opportunities, the possibilities in every moment; to trust and believe in my own power and intuition, and to breathe through difficult situations and challenges. Yoga has taught me to be soft and to give space, both to myself and therefore also to everybody else. I’ve learned from my own experience to first shift things for myself and then everything else will shift with me. I have now found the relationship for which I had always longed, but it was not until I shifted myself that I was able to meet the man of my dreams. It is the most beautiful gift for me to share my passion for yoga with other people in my classes and to see how fast transformation can happen: how people are calmer, happier, more radiant with yoga. It is not important for me that you can put your foot behind your head or get into difficult asanas, but rather that you feel good about yourself, so that you will find clarity, peace and strength and learn to trust yourself. I love to empower people to live their dreams. Dagmar Spremberg moved from Germany to Los Angeles in 1996 and began practicing and studying yoga. After moving to New York, she intensified her studies and trained with certified Anusara teacher Elena Brower at Virayoga. She moved to Montezuma, Costa Rica in 2001 and founded Montezuma Yoga and began teaching yoga and organizing yoga retreats with international renowned teachers of all styles. 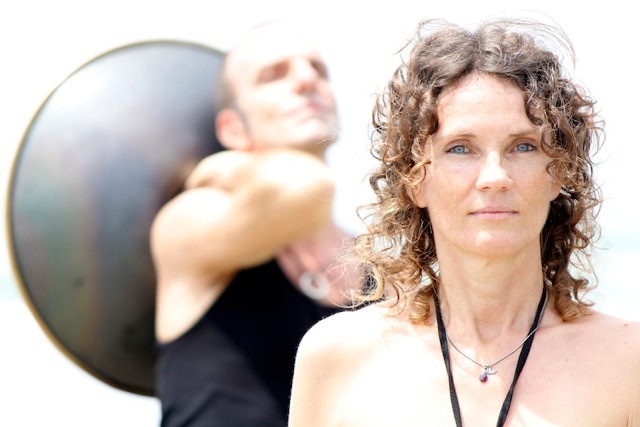 Dagmar is a 500-hour certified E-RYT with the Yoga Alliance and an Anusara-inspired teacher. As a graduate of the Institute for Integrative Nutrition in NYC she complements yoga with her work as a certified Holistic Health Counselor and teaches lifestyle immersion programs within the Montezuma Yoga 200 Hr Yoga Teacher Trainings. Dagmar lives with the Swiss artist and musician Daniel Gautschi, in Montezuma, Costa Rica, where they run La Candela Mountain Retreat. 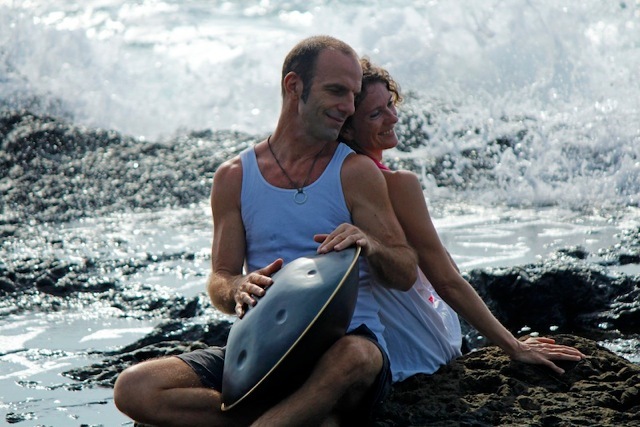 Daniel plays the magical instrument called Hang in Dagmar’s yoga classes and they perform frequently together in Costa Rica and Europe. Dagmar’s Yoga DVDs are available on her website as well as Daniel’s new CD “The Gaudan Project – Hold Still.” For more information please visit www.montezumayoga.com and check out Dagmar’s Facebook page here. This entry was posted in Love / Relationships / Divorce, The Yoga of Life and tagged beach, Costa Rica, Dagmar Spremberg, Daniel Gautschi, destiny, dream, Elena Brower, inspiration, intuition, journal, La Candela Mountain Retreat, life, Montezuma, Montezuma Yoga, The Yoga Diaries, transformation, Virayoga, yoga, yoga teacher by The Yoga Diaries. Bookmark the permalink. great piece, you certainly are living the dream! It is very much a gift to be able to teach and share yoga. I hope to be doing exactly the same some day soon. Beach good, Yoga Good …step #1 become yoga instructor…Maha Shakti Teacher Training!